If you're eating products containing non-organic wheat, you may have started to wonder if you have a gluten allergy. 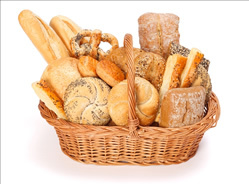 People are avoiding gluten more and more, as they realize that they're sensitive to these wheat products. But it may not be the gluten that's bothering you at all. Unfortunately, the truth is much more toxic. When you eat non-organic wheat products, you're not just having a sandwich. You're also consuming small amounts of the herbicide Roundup (glyphosate). Roundup is toxic, but that doesn't stop farmers from drenching their wheat fields in it a few days before harvest. This practice of using Roundup on wheat has become much more common over the past 15 years — which you'll notice has also been when we've been seeing a rise in “gluten sensitivity.” Farmers use Roundup because it kills the wheat, actually causing it to release more seeds as it dies and increasing yield. It also allows farmers to even out parts of wheat fields that have ripened unevenly. This practice has become so common that, according to the U.S. Department of Agriculture, in 2012, farmers had treated 99% of durum wheat, 97% of spring wheat, and 61% of winter wheat with the herbicide. Despite its prevalence in wheat, Roundup is not allowed to be used on malt barley that will be made into beer. Nor can lentils or peas be sold if they've been sprayed. But for some reason, it's acceptable to spray the wheat. The herbicide industry insists that glyphosate is “minimally toxic” to humans. I'm not the only one who doesn't find that comforting. A study by Anthony Samsel and Stephanie Seneff of MIT, published in the journal Entropy, looked into glyphosate's effects on mammals. They found that it had a major disruptive effect on a pathway in our guts, which we need to make amino acids. By disrupting this pathway, Roundup contributes to gut permeability and autoimmune disease symptoms. It also prevents the biosynthesis of enzymes that help detoxify our bodies. So not only does consuming Roundup cause negative effects on its own, it also leaves you more vulnerable to the effects of other toxins you may encounter. The effects of glyphosate exposure are cumulative. Over time it can contribute to gastrointestinal disorders, obesity, diabetes, heart disease, depression, autism, infertility, cancer, multiple sclerosis, and Alzheimer's. No wonder people are starting to recognize that they don't feel their best when they eat wheat! If that's you, the good news is you may not have a gluten allergy at all. The bad news is you still shouldn't consume wheat treated with Roundup — which is nearly all of it. Stick to organic wheat only. If you aren't sure whether the wheat is safe or not, it's best to avoid it altogether.